The finite element methods are an alternative to the finite difference discretization of partial differential equations. 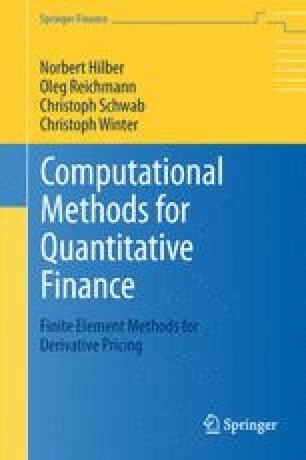 The advantage of finite elements is that they give convergent deterministic approximations of option prices under realistic, low smoothness assumptions on the payoff function as, e.g. for binary contracts. The basis for finite element discretization of the pricing PDE is a variational formulation of the equation. Therefore, we introduce the Sobolev spaces needed in the variational formulation and give an abstract setting for the parabolic PDEs.